This is a really fun video with a really interesting story. So much happens in this crazy back and forth match that I’m just going to try to talk more about the story than the action, otherwise we’ll be here all day. Sumiko is challenging Sapphire once again for the belt. Sapphire asks how many times does she have to beat Sumiko. Sumiko promises to never challenge her again if she loses again. Sapphire likes that deal, so the match is on. The battle rages back and forth, Sapphire has the 1st lengthy time of control, but Sumiko isn’t going down as easy as she has before. Sumiko gets control and almost wins the match with a wall assisted sleeper. After a double clothesline Sapphire hits a piledriver and her Sapphire bomb, but Sumiko still isn’t done. Sumiko slips out of Sapphire next planned finisher and a Canadian Destroyer put her in control. Sumiko stays in control nailing tons of crazy moves including not one but 2 piledrivers on Sapphire. Sumiko takes her split pin and counts Sapphire out. At the count of ten however where snap to Sumiko shutting off her alarm clock, than going back to sleep. 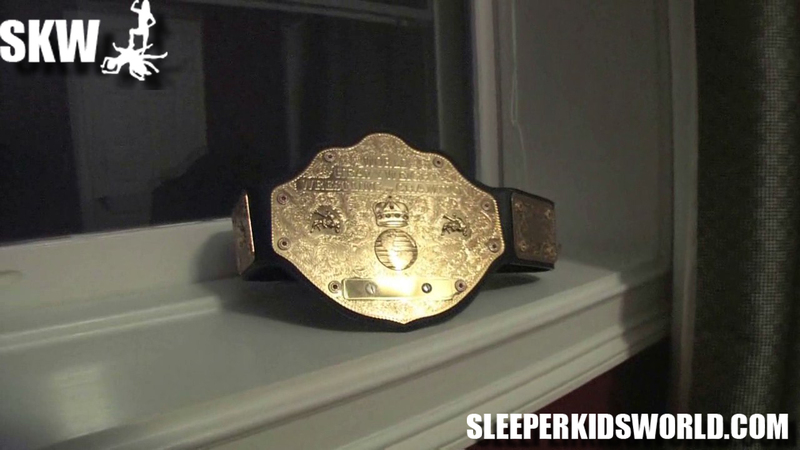 As the camera pans away, we see the SKW belt on the window-sill than we fad back to Sumiko celebration and victory pose. This is a great video, Sumiko and Sapphire are both outstanding. They nail everything to perfection and sell it all the the best of their abilities. Also the dream idea is a great idea, it does leave us to wonder if Sumiko did actually beat Sapphire. The craziest thing in this video, is watching Sumiko piledrive Sapphire. It is mind boggling to watch. The amount strength that comes out of that little body is out of this world. That being said, I don’t know if Sumiko should be SKW champ, only because she’s also one of the best jobbers in SKW. So, should the SKW champ just be based on being dominate or being a fan favorite? I personally want to see Sumiko lose all the time, because she’s just that amazing of a jobber. In the same breath she’s also an incredible heel and apparently incredibly strong. So I don’t know. Nonetheless, this video my not be my favorite of the update, but is definitely one for the record books and one worth checking out.